Iran has unveiled a satire book about the nuclear talks it had with world powers. In a ceremony held in Tehran’s Niavaran Cultural Centre, a book titled The Elegant [which means Zarif in Persian] Aspects of Negotiations was unveiled. According to a report by ISNA, as translated by IFP, the ceremony was attended by Iran’s Minister of Foreign Affairs Mohammad Javad Zarif, Deputy Minister of Culture and Islamic Guidance, members of Iran’s nuclear negotiation team, and the bereaved families of nuclear martyrs. 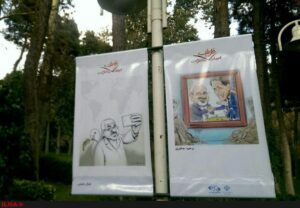 The book, which was unveiled on October 1, contains satirical poems, caricatures, and cartoons about the nuclear talks between Tehran and world powers. In an address to the ceremony, the organizer and producer Abbas Sajjadi, the director of Niavaran Artistic Creations Foundation, hailed the efforts made by satirists and cartoonists who, since the early days, looked at nuclear negotiations from a different perspective. “I shared the idea with Mr. Zarif and the rest of the negotiating team and they said that we should wait until the ratification of JCPOA,” he noted. 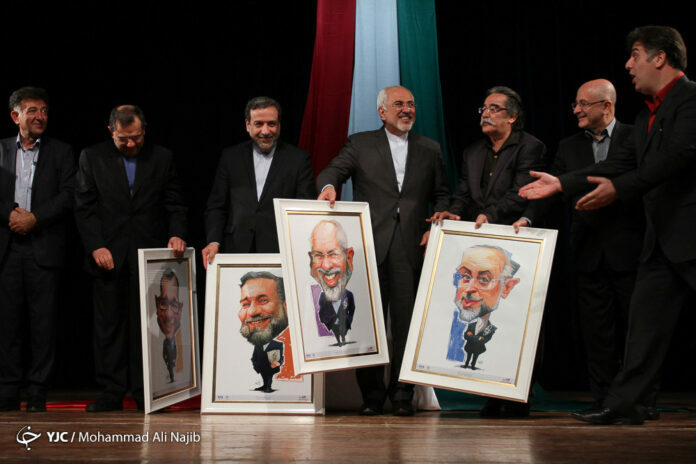 The book is a compilation of poetry and caricature which depicts the story of the national epic of the nuclear deal, known as JCPOA, in the eyes of culture and art professionals. Jannati stressed that satire is able to provide a sweet wrapping for bitter events of the society and helps people gain a better understanding of contentious issues gently. “If a diplomat is confident that his efforts will lead to victory, bearing all the difficulties and concerns of negotiations will become easy and even sweet to them,” he added. He concluded that if it wasn’t for people’s endurance, understanding, wisdom, patience and equanimity, there would be no possibility of any breakthrough on any subject.